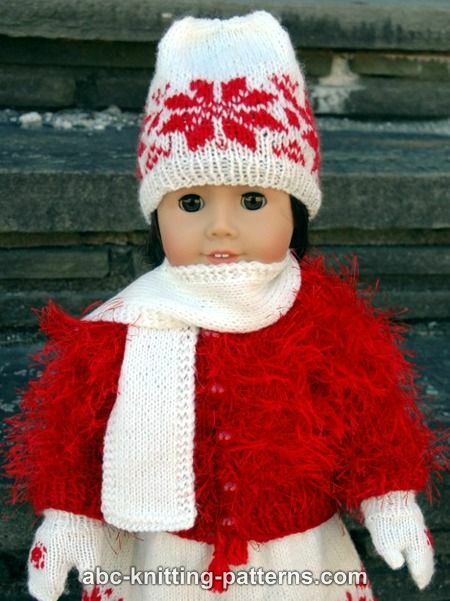 A pair of warm mittens and a scarf are essential winter-time accessories for the American Girl Doll. 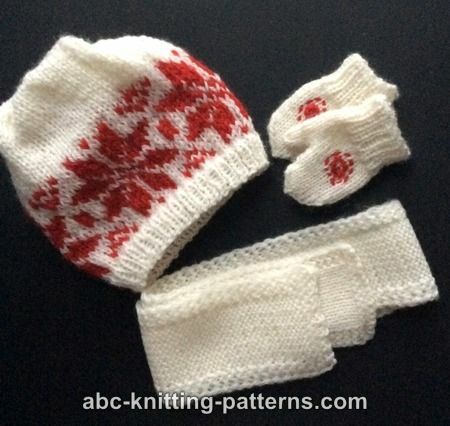 I describe two styles of mitten and two styles of scarf. 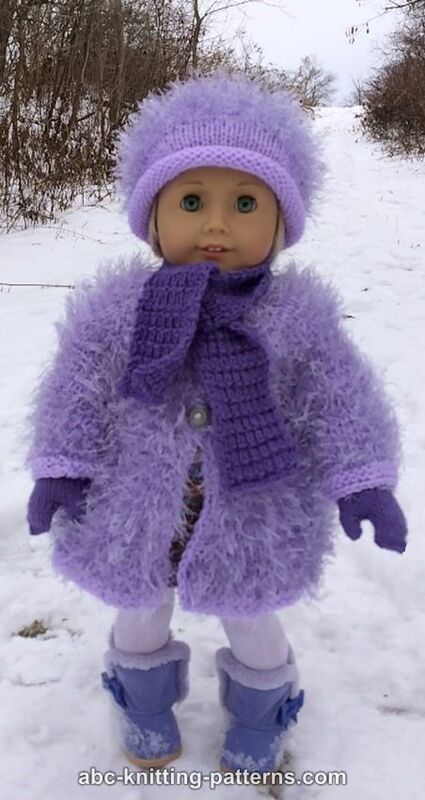 With the right color choices, these can be made to match any cold-weather outfit for your doll. 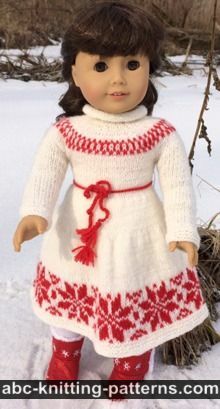 I knitted a set to match the AGD Nordic Winter Dress and Hat. psso - Slip the first st on the right needle, knit together the next two stitches. 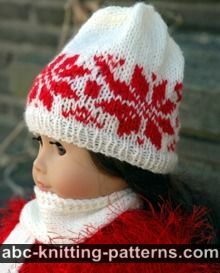 Insert the left knitting needle into the slipped stitchs and passl it over the k2tog-stitch. 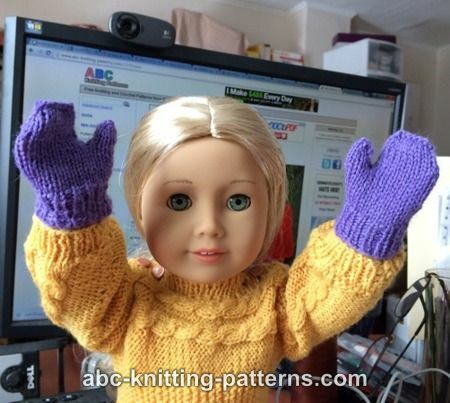 Mittens are worked in the round, seamless, top-down. 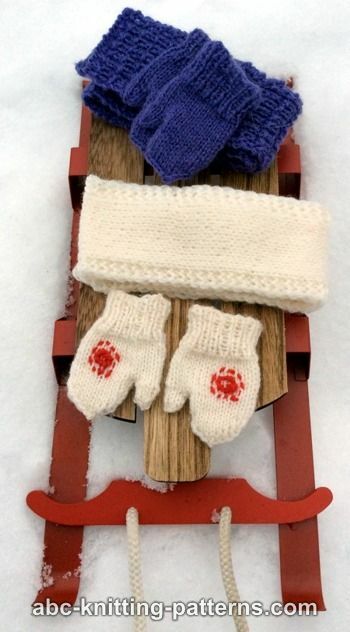 The lavender mittens are simpler to make, but they do not have a taper at the end of the fingers like the white ones and look a little more rustic. This may or may not be important to you. Cast on 28, distribute them evenly on dpn, join and continue to work in rounds, take care not to twist sts. Work 1x1 rib for 10 rounds, continue in stockinette and work 10 more rounds. Round 1: knit 4 sts and transfer them to a holder (1" safety pin), knit the next 4 sts and transfer them to another holder (1" safety pin), knit the remaining 20 sts, then close them in the round. Work 3 more rounds on 20 sts. Round 11: k2tog - psso the last slipped st of the previous round over k2tog- st, psso, 2 sts remain, pass the last over the first and tie off. Work 5 rounds on 8 stitches. Round 6: k2tog 4 times. Break yarn, leaving a 2-3" end. Thread the end through remaining sts and fasten securely. Weave in the ends. 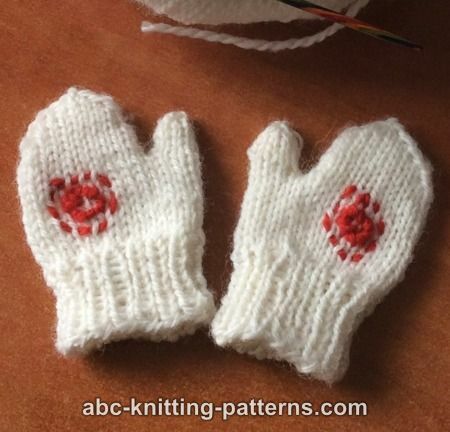 With a piece of contrast yarn, embroider a circle on the front of the white mitts. Cast on 28, distribute them evenly on dpn. Close into round. Palm: knit 4 sts and transfer to a holder (1" safety pin), knit the next 4 sts and transfer to another holder (1" safety pin), knit 20 sts in the round. Work 3 more rounds on 20 sts. You have 12 sts. Transfer 6 sts to one needle and 6 sts to another. Make 3 needle bind off. Both scarves are worked on straight needles forward and back. Selvedge stitches: slip the first stitch knitwise and purl the last stitch in a row. The finished size is 2" x 20" (5 x 50 cm). Rows 3 and 4: *k1, p1 - repeat from * to the end. Repeat 4 rows to desired length. Cast on 16 sts. Work the pattern, don't forget that the first and the last stitches in the row are edge stitches. Work until the piece measures 15" long, or to desired length. Bind off. Weave in the ends. Block. Cast on 16 sts, the first and the last stitches are selvedge sts. Work 2 rows in garter st.
Row 3: sl1 ( selvedge), k 14, p 1 (selvege). Row 4: sl 1, k 2, p 10, k 2, p1. Repeat rows 3-4 until the piece measures 20" (50 cm) or to desired length. Work the last 2 rows in garter st. Bind off. Weave in the ends. Block.